PARIS – MARCH 27, 2018 Velcro Companies today announced the launch of its new VELCRO® Brand SWITCH™ Wall Decor solution that provides businesses with an easy-to-use alternative for hanging and displaying large-scale, branding and promotional signage. With the VELCRO® Brand SWITCH™ Wall Decor system, retailers, marketers, advertisers and tradeshow exhibitors can rapidly change and update their signage to communicate more updates, offers and information to their customer base. Initially designed to be used with Wollux signage, VELCRO® Brand SWITCH™ Wall Decor products provide several benefits over competitive products including magnet walls, printed panels, stickers, or textile frames. VELCRO® Brand SWITCH™ Wall Decor solutions can be used to decorate the walls of any shop, retail, office or exhibition space, can be re-positioned or removed. Self-adhesive hook affixed in the wall allows for fast install and replacement of the textile nonwoven graphic part. Ideal for temporary spaces, VELCRO® Brand SWITCH™ Wall Decor enables companies to customize their space without mess. Moreover, the solutions repositionable feature avoids any wrinkle or waviness in the graphic. 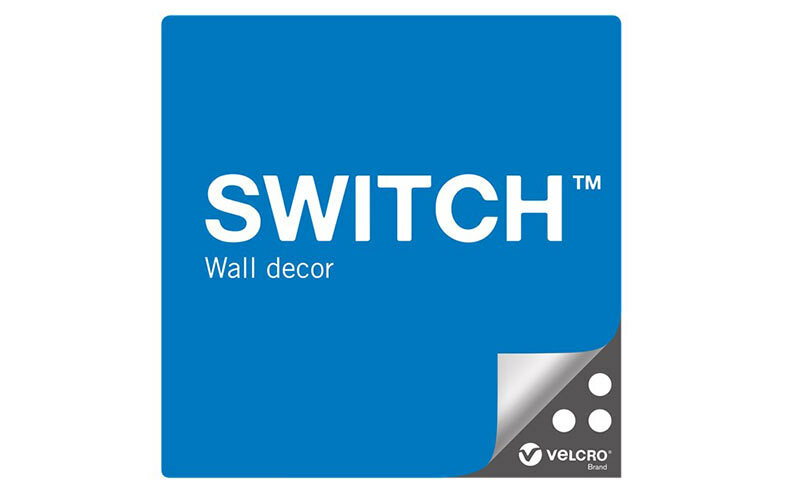 The adhesive-backed VELCRO® Brand SWITCH™ Wall Decor hook is available in lightweight squares (450 x 450mm) and can be applied to any material or surface without the use of tools or professional installation. The new solution is on display and available for demonstration at the Point of Purchase Advertising International show in Paris, March 27-29; please visit the Wollux booth E22. Velcro Companies is a technology-driven, global organization providing fastening solutions that solve problems in simple, elegant and surprising ways for businesses and consumers around the world. We have a heritage of innovation spanning more than 50 years and own over 400 active patents and numerous trademarks, including the VELCRO® trademark, which is registered throughout the world. We develop and deliver solutions for customers through an integrated production and service system that includes manufacturing locations in the United States, Belgium, Canada, Mexico, Uruguay, Spain and China and sales offices around the world. To find out more about our company, visit www.velcro.com. The proper use of the VELCRO® trademark assists us in safeguarding the integrity of the VELCRO® brand, and helps to protect consumers from products incorrectly sold as VELCRO® brand products. Wollux has been a trusted supplier of promotional textiles for over 70 years and is the market leader in the Benelux countries. It produces high-quality, durable promotional materials at competitive prices. The company’s hard-wearing products can be used indoors and outdoors and include custom flags, displays, banners or parasols. Wollux’s global distribution is managed by sales operations in Belgium, the Netherlands, France, Spain and Germany. To learn more about Wollux, please visit, www.wollux.com.